Continuing with their fine sheets on British subjects, this new one is sure to be a delight to those who model 1930s aircraft. The sheet (or should I say sheets) allows the builder to do six different types and seven different markings options. Model Alliance has also improved on their instructions. It is now a very nicely done booklet that has all the information on each type on its own page, complete with four view drawings, an especially nice touch. Each page includes background information on the subject as well as additional color information. Were I to make a suggestion, it would be to increase the size of the font as it is very small and difficult for these old eyes to read. First up is a Fairey Flycatcher from 408 Flight aboard the Glorious in 1930. The third option is a Sea Gladiator from 802 Squadron, also with the Glorious (I see a trend here) in 1939. Fourth is an 832 Squadron Swordfish from (you guessed it) Glorious in 1939. The Walrus I in overall silver is from 718 Flight aboard the HMS Exeter in 1937. Then we have a target tug Skua with 767 Squadron in 1939. The final aircraft is not shown on the cover, but is a camouflaged Walrus with 712 Squadron aboard the HMS Cumberland in late 1939. Kits for all of these are available, though some may need a bit more searching than others (like the Flycatcher in 1/72). Overall, a superlative set of decals covering some most interesting aircraft types. The decals themselves are crisply printed and quite colorful. I know you will be pleased. Also available in 1/48 scale. Review sample courtesy of Model Alliance. 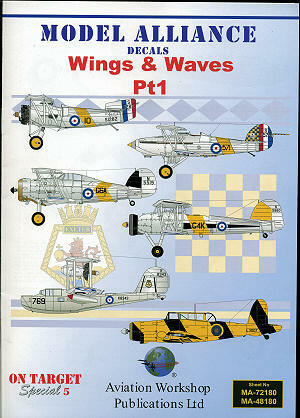 This sheet can be found at www.theaviationworkshop.co.uk and at quality hobby shops worldwide.